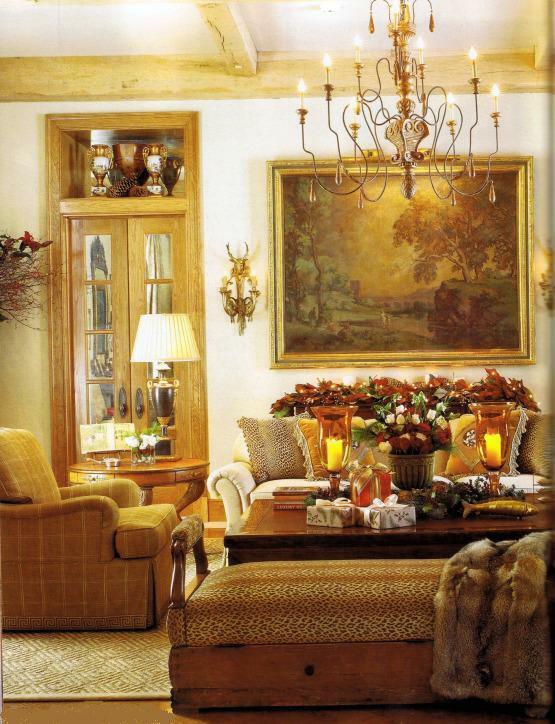 Elegantly festive, this living room caught my eye with its beautiful hand-picked furniture and its classie French style! I love the combination of casual and classic, the rustic and the refined elegance all mixed together. The Christmas decoration is distinct yet not overdone, and the attention to the detail goes on the awning stripe animal print throw pillows on the sofa, and the eye-catching super big ombre Leopard print ottoman. The finishing touch -a fox fur throw- adds warmth and luxury. It feels like Christmas! Photo courtesy of Traditional Home. I love animal prints!! But they have to be faux for me.